Because it would be hard to find a Western leader who has done more to support the rise of Sunni fanaticism and mass murder, than Charles himself. On behalf of the British Crown, Charles has cultivated financial and personal relationships with precisely those leading government and other personalities in Saudi Arabia, Qatar, Kuwait, and the UAE, who bankrolled and fomented the growth of al-Qaeda, and now ISIS. Students of the British Empire’s systematic promotion of bloody sectarian warfare in the Middle East over the last century would be astonished, if Charles were doing otherwise. Kingdom Saudi Arabia in its present form was created by the British Empire in 1901-32, as an extension of that Empire. When Abdulaziz al-Saud, known as Ibn Saud, became the first King of Saudi Arabia in 1932, he had already been collecting a British stipend for more than a decade. The Kingdom was a British-sponsored fusion of his tribe with the fanatical Wahhabi clerics infesting the Saudi peninsula, who preach the doctrine of the 18th-century Abdul Wahhab (who allied with the Saud family in 1744), that all “non-believers”, including Shiite Muslims, should be put to the sword. The British and Saudi crowns have remained intimately linked. It is no secret that today’s militant jihadis emerged from the “Arc of Crisis” policy, associated with Zbigniew Brzezinski3)http://en.wikipedia.org/wiki/Zbigniew_Brzezinski of the late-1970s Carter Administration in the USA. This scheme was rooted in British designs to dismantle the Soviet Union, out of which emerged the “Bernard Lewis plan”4)http://en.wikipedia.org/wiki/Bernard_Lewis, named for a top British Orientalist. Lewis and Brzezinski sought to promote Wahhabite fundamentalism in an “arc of crisis”5)http://www.foreignaffairs.com/articles/32309/george-lenczowski/the-arc-of-crisis-its-central-sector along the southern border of the Soviet Union, to crack the Communist regime through religious movements. Charles’s friends in the Saudi, Qatari, and other Gulf kingdoms were leaders in that effort, into which they poured untold billions of dollars. Today, with continuing British imperial sponsorship, those creators of alQaeda have created ISIS. fomenting endless bloody religious warfare on all sides, to the advantage of a small ruling elite. Saudi Intelligence and Al-Yamamah Chief among the British agents in the al-Qaeda/ISIS project is Prince Bandar bin Sultan6)http://en.wikipedia.org/wiki/Bandar_bin_Sultan, one of the most influential Saudi personalities of recent decades. He has been Saudi Ambassador to the USA (1983-2005), Secretary-General of the Saudi National Security Council (2005-present), and head of Saudi Intelligence (2012-14). According to his biographer, William Simpson, Bandar personally funneled $3 billion to the mujahedin who gave birth to al-Qaeda. American intelligence sources report that the devoted Anglophile Bandar was recruited to British SIS during his education at the elite Cranwell Royal Air Force College7)http://en.wikipedia.org/wiki/Royal_Air_Force_College_Cranwell, which Charles also attended. In 1985, Bandar and Prime Minister Margaret Thatcher negotiated the AlYamamah arms contract between Saudi Arabia and Britain, the largest export deal in British history, later phases of which were facilitated by Charles in person. The Saudis provided up to 600,000 barrels per day of oil, in return for arms from the British Ministry of Defence and Britain’s largest arms company, BAE Systems.8)http://en.wikipedia.org/wiki/BAE_Systems and Australian http://en.wikipedia.org/wiki/BAE_Systems_Australia. The deal created an “off the books” slush fund, estimated at over $100 billion and implicated in financing al-Qaeda and ISIS. As Saudi Ambassador in Washington, Bandar was up to his ears in money and protection for the 9/11 attackers against the Pentagon and New York’s Twin Towers. Those events unleashed the Anglo-merican-led “war against terrorism”, beginning with aerial attacks on Afghanistan in 2001 and the invasion of Iraq in 2003. Bandar is known to figure in the 28 pages of the Joint Inquiry9)858 page report http://fas.org/irp/congress/2002_rpt/911rept.pdf into the 9/11 attacks, withheld by the George W. Bush and Obama Administrations. Bandar’s career, and his own and his family’s and associates’ relations with Prince Charles, are testimony to the British Crown’s fostering of endless religious warfare in the: Middle East, and fascist police states in Britain, the United States, Australia and elsewhere, under the banner of “fighting terrorism”. Veteran British journalist Patrick Cockburn titled his 13 July 2014 column in The Independent, “Iraq crisis: How Saudi Arabia helped ISIS take over the north of the country”10)http://www.independent.co.uk/voices/comment/iraq-crisis-how-saudi-arabia-helped-isis-take-over-the-north-of-the-country-9602312.html. “The fatal moment predicted by Prince Bandar may now have come for many Shia, with Saudi Arabia playing an important role in bringing it about by supporting the anti-Shia jihad in Iraq and Syria. Since the capture of Mosul by the Islamic State of Iraq and the Levant (ISIS) on 10 June, Shia women and children have been killed in villages south of Kirkuk, and Shia air force cadets machine-gunned and buried in mass graves near Tikrit. “In Mosul, Shia shrines and mosques have been blown up, and in the nearby Shia Turkoman city of Tal Afar 4,000 houses have been taken over by ISIS fighters as ‘spoils of war’. Simply to be identified as Shia or a related sect, such as the Alawites, in Sunni rebel held parts of Iraq and Syria today, has become as dangerous as being a Jew was in Nazi-controlled parts of Europe in 1940. “There is no doubt about the accuracy of the quote by Prince Bandar, secretary-general of the Saudi National Security Council from 2005 and head of General Intelligence between 2012 and 2014, the crucial two years when alQa’ida-type jihadis took over the Sunni-armed opposition in Iraq and Syria. Dearlove’s recounting of Bandar’s intention “has attracted surprisingly little attention”, observed Cockburn. No wonder: to follow its implications leads straight to the door of Prince Charles and his parents. A second generation of relations between the British and Saudi Royal families was established during several days of meetings in Britain in 1967, between Queen Elizabeth II and King Faisal bin Abdulaziz al-Saud13)http://en.wikipedia.org/wiki/Faisal_of_Saudi_Arabia (son of Ibn Saud)14)http://en.wikipedia.org/wiki/Ibn_Saud, who had been foreign minister since 1932, continuing even after he became King in 1964. As foreign minister, Faisal had created the Muslim World League15)http://en.wikipedia.org/wiki/Muslim_World_League (MWL) in 1962, as the coordinating centre for Wahhabite propaganda and subversive activity (including sponsorship of the British intelligence created Muslim Brotherhood). It was the seed crystal of today’s international Sunni terrorism. In due course, Prince Charles inherited the “Royal franchise” on relations with the Saudi kingdom, paying his first official visit to Saudi Arabia in 1986. In the 1990s he helped to arrange Al-Yamamah II, the second phase of the arms-for-oil deal. During his tenth official visit, 17-19 February 2014, he finalised the massive Al-Salem arms deal, in which BAE Systems will sell 72 Eurofighter Typhoon aircraft to the Saudis16)http://www.telegraph.co.uk/finance/newsbysector/epic/badot/10648144/BAE-agrees-pricing-on-Typhoon-deal-with-Saudi-Arabia.html. Because of the rampant illegalities in the Al-Yamamah deals, including at least £1 billion in bribes paid to Bandar, the British Serious Fraud Office investigated it in 2003-06. The probe, however, was shut down due to “irresistible pressure”, said Queen’s Counsel Dinah Rose, representing activists against the international arms trade. cited “national and international security”, claiming that, “Our relationship with Saudi Arabia is vitally important for our country in terms of counter-terrorism”, while Bandar himself, as head of the Saudi National Security Council17)http://en.wikipedia.org/wiki/National_Security_Council_%28Saudi_Arabia%29, threatened that the Saudis would withdraw their cooperation on security, including intelligence gathering on al-Qaeda. One of “Charles’s friendships”, which New Scotland Yard terms a matter of “delicacy and sensitivity”, according to Hollingsworth, is with Bandar bin-Sultan, who sits in the centre of that web of terrorism financing. Simpson wrote in his Bandar biography, that Charles invited only eight foreign royals to his wedding, among them Bandar and his brother-in-law Prince Turki, head of Saudi General Intelligence from 1979 to 2001, during which time al-Qaeda was constructed. Bandar held Margaret Thatcher, with whom he struck the original Al-Yamamah deal, “in particularly high esteem”, Simpson reported. “Equally, his friendship with Prince Charles is also very close, and Charles extended a personal invitation to Bandar to his wedding to Camilla Parker Bowles in April 2005. 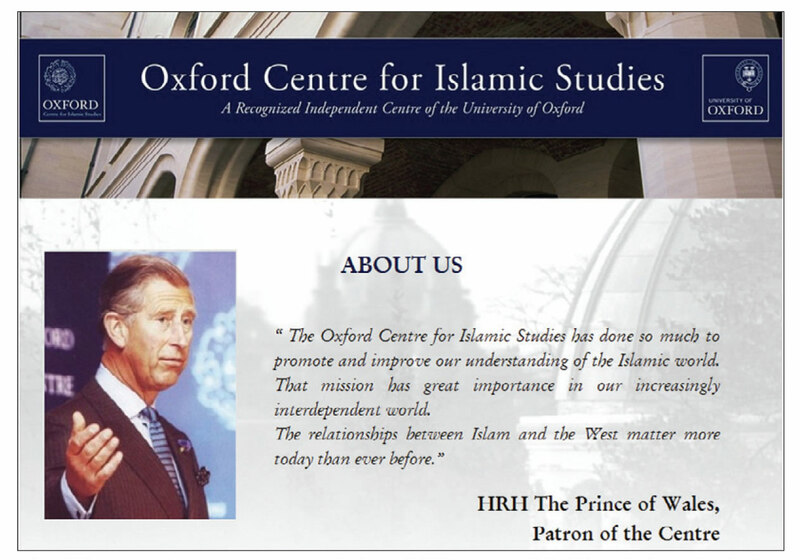 The “about us” page on the website of “Charles’s OCIS”, as it is called after its Patron, the Prince of Wales. OCIS Board members and financial backers include Saudi royals, implicated in backing terrorism. the: Oxford Centre for Islamic Studies (OCIS) 20)http://en.wikipedia.org/wiki/Oxford_Centre_for_Islamic_Studies, created at Magdalen College, Oxford University in 1985 (the inaugural year of Al-Yamamah); Visual Islamic and Traditional Arts (VITA)21)http://en.wikipedia.org/wiki/The_Prince%27s_School_of_Traditional_Arts at the Prince’s School of Traditional Arts; and the Centennial Fund,22)http://www.tcf.org.sa/Dimm/TCF/Pages/Default.aspx established in 2004. The boards of all three are packed with the same Saudi/Gulf royalty and clerics who created al-Qaeda and ISIS. According to the 10 May 2012 Oxford Times, Charles has been an enthusiastic supporter of OCIS since its founding. In 1993 he became its patron, and is so influential in its activities that the press sometimes calls it “Charles’s OCIS”. One OCIS cofounder is Abdullah Omar Naseef, named in the court case brought by families of 9/11 victims, for his role in supporting the hijackers. Princes Bandar and Turki also have worked with Charles in VITA, of which Turki served as chairman from the mid-1990s until at least 2010. In 2004, Charles set up yet another charitable front, the Centennial Fund. Chairman of its Board of Trustees is Prince Abdulaziz bin Abdullah, deputy foreign minister of Saudi Arabia; he was adviser to Crown Prince (now King) Abdullah, his father, on Syria, during the build-up of Saudi funding and arming of Wahhabi terrorists there, out of which ISIS emerged. 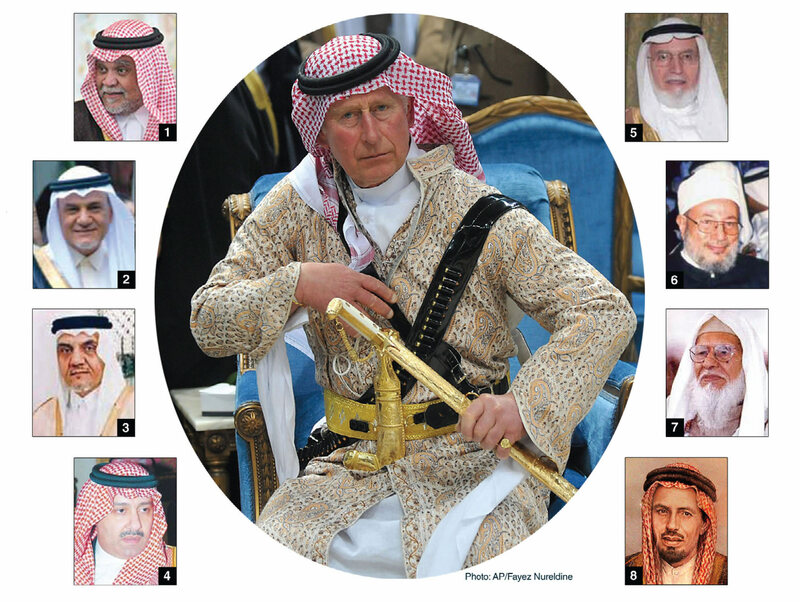 In the centre picture, Charles “goes native” on a February 2014 visit to Saudi Arabia, during which he performed a sword dance with members of the Saudi royal family. Surrounding him are board members and financial backers of the Oxford Centre for Islamic Studies (OCIS), known as “Charles’s OCIS”, including members of the Faisal and Bin Laden families, who have contributed to it. Each of the Persian Gulf figures pictured here is also implicated in financing terrorism. 1.0 Prince Bandar bin Sultan. His biographer calls his friendship with Charles “close”. He was a wedding guest of Charles and Camilla. In 1990, Bandar contributed an estimated $US13-24.4 million to the OCIS. At Bandar’s behest, then-King Fahd pledged a $32.4 million donation from the Kingdom to the OCIS; Bandar announced the gift at a 1997 private dinner with Charles. Former Saudi Ambassador to Washington and Intelligence chief, Bandar heads the Saudi Security Council. He and his wife have been implicated in funding the 9/11 attackers. He also arranged the first Al-Yamamah oil-for-arms contract with PM Margaret Thatcher in 1985, an ongoing deal in which the Prince of Wales later took a hand. is a member of the Board of Trustees of the OCIS and chairs its Strategy Advisory Committee. Another of Charles’s wedding guests, he resigned as director of Saudi General Intelligence (1979-2001) ten days before 9/11. Turki financed and organised the rise of al-Qaeda in the 1980s. He was Saudi Ambassador to the UK (2003-05) and USA (2005-06). is another member of the Faisal clan, which has sponsored the OCIS. A full brother of Turki, he heads the Dar Al-Mall Al-Islami Trust (DMI) banking group, which financed al-Qaeda, according to a 2002 report to the UN Security Council. Mohammed was named in a 9/11 family-member lawsuit. deputy foreign minister of Saudi Arabia, is chairman of the Board of Trustees of the Centennial Fund, established by Charles in 2004. He is an expert on Syria, where Saudi financing of the radical Sunni opposition groups, out of which ISIS emerged, is notorious. co-founded the OCIS and chairs its Board of Trustees. He has long been associated with the Prince of Wales through the OCIS. He was Secretary General of the Muslim World League (MWL) in 1983-93, at the height of Anglo-American backing for the Afghan mujahedin against the Soviet Union. The future King Faisal had set up the MWL in 1962 to coordinate Wahhabite propaganda and subversion (including backing the Muslim Brotherhood, a British Intelligence project). The MWL spawned significant parts of today’s global jihadi apparatus. Naseef also chaired the Pakistan-based Rabita Trust, an MWL financial project. In the 1980s, Naseef co-created Maktab al-Khidamat, the backbone organisation of the Arab-Afghani mujahedin in Afghanistan, which in 1989 changed its name to al-Qaeda. According to the 9/11 families’ suit, Naseef knowingly funded al-Qaeda through the MWL, Rabita, and the International Islamic Relief Organization (IIRO). was formerly a board member of Charles’s OCIS (1985-2006). This Qatar-based spiritual leader of the Muslim Brotherhood issued fatwas for the overthrow and assassination of Libyan head of state Muammar Qaddafi and Syrian President Bashar al-Assad. In July 2012, he threatened the assassination of Egyptian leader Gen Abdel Fattah al-Sisi, now President. Co-founder of the OCIS and its chairman from its inception in 1985, through the late 1990s, when Charles was its patron. In 1962, Nadwi had been a founding board member of the MWL. (shown here, Mohammed bin Laden, father of Osama) was among the Saudi, Qatari, and Kuwaiti private donors of approximately $US70 million to Charles’s OCIS. The Bin Laden family endowed the Mohammed bin Laden chair at OCIS. Osama bin Laden was recruited by Charles’s friend and wedding guest, Prince Turki bin Faisal, to set up the Maktab al-Khidamat network, the future al-Qaeda, in which Charles’s colleague Naseef was also closely involved. His financial network included dozens of City of London banks and corporations, according to a 2001 French parliamentary investigation. These Executive Intelligence Review articles are available in the EIR Archive at www.larouchepub.com. 1. ↑ The Islamic State in Iraq and Syria [or “and the Levant”—ISIL].